Time to shed a light – literally – on a forklift accessory that’s always taken for granted, increases safety and efficiency and has gone through significant upgrades in the past generation. We’re talking about forklift lights, of course. From the dated regular bulb headlights to today’s super-sleek LED lights, forklifts now enjoy some serious safety-first illumination, both inside and outside the operator cabin. Tons of lighting options are available for forklifts. Which ones should your company consider? CertifyMe.net, the leader in online, OSHA compliant forklift certification since 1999, knows all about the importance of safety lighting for powered industrial trucks. Lights are just one of the many safety accessories we cover in our forklift training courses. Our training modules review everything your employees need to know about safety operating powered industrial trucks. Check out our course selection and pricing to get started today! 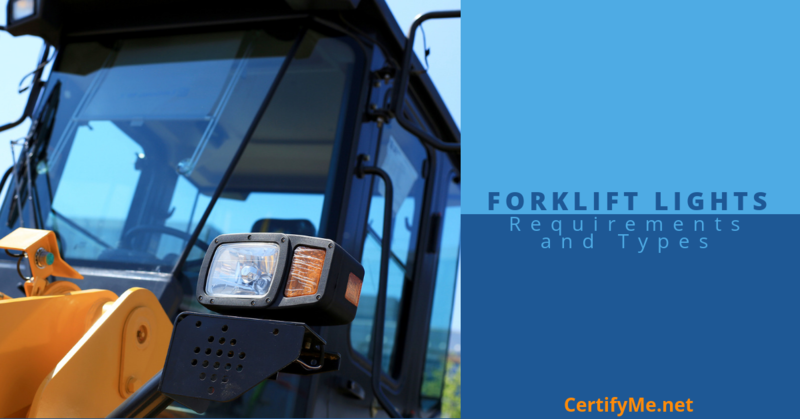 According to OSHA regulation 1910.178(h)(2), forklift headlights are required in dimly lit indoor areas, outdoor areas at night, and everywhere else auxiliary lighting is required. Forklift headlights are the most common type of auxiliary lighting for powered industrial trucks. Even in indoor warehouse work settings, headlights help alert other forklift drivers, pedestrians, and other personnel of approaching forklifts. Since most of a forklift driver’s focus is usually focused in front of the vehicle, it’s important that the lights are kept up on a regular basis. Forklifts are also required to travel in reverse when unloading trucks and for other tasks, tail lights and backup lights are also critical for safety. Similar to headlights, tail lights and backup lights require scheduled checks and should be replaced immediately if any defects are found. Strobe lights and side-mounted warning lights are popular solutions for forklift drivers who need extra lighting, or when working conditions demand additional light for moving, storing, and managing cargo and other materials. OSHA encourages the use of strobe lights and other advance warning light systems, as long as the forklift’s other lighting systems are also working as intended. Thanks to a 2004 interpretation of various OSHA lighting safety standards, strobe lights are now available for every forklift as add-on accessories. Many forklifts have strobe lights and other warning lights standard. Aside from a forklift’s standard lights, your company may require even more lighting configurations for regular or specialized forklift duties. Always check with your supervisor or safety coordinator to assess your forklift fleet’s particular needs. Getting the “right” forklift light can mean the difference between a safe work environment and an accident or injury. Let’s look at some shining examples of illuminated excellence available for today’s forklifts! If you need an extra measure of safety for poorly lit areas or outside maneuvering, this “Red Zone” side-mounted light is a great add-on. It helps warn pedestrians and other forklift drivers, thanks to an ultra-bright IP68 LED lighting configuration. With a 30,000-hour minimum service life, this is one of the best add-on lights for your forklift! Sometimes, standard headlights leave much to be desired in the power department. With this forklift blue light, everyone in the near area knows your forklift is moving. This very powerful light is great for outdoor areas with fog, regular nighttime duty, and all sorts of indoor areas. Grab one today, and improve your work area’s overall safety! With bright LED illumination, easy-install configuration, and high-quality design, this Xprite 30 LED Amber/Yellow 15W Emergency Warning Flashing Light is the perfect way to ensure better safety at your warehouse, distribution center, dockyard, or other forklift working area. If your forklifts work in a well-lit setting, green is easier to see than other colors. Which means this Green LED Warning Light makes sense. Made with a sturdy aluminum housing and waterproof durability, this advanced warning light is ideal for both indoor and outdoor work areas. These are only a few of the lighting accessories available for your forklift. If you have any questions about your own forklift fleet’s lights or need help getting with your safety training program, call CertifyMe.net today at 1-888-699-4800. From OSHA approved lighting configurations to safe forklift driving procedures, we’ll get your company compliant. Browse our training courses and get started today!